The USS Lexington is as tall as a 19 story building and as long as three New York City blocks. You could park more than 1,000 automobiles on its flight deck. It has more telephones than a city of 5,000. It has crossed the equator 13 times. It was the first carrier to deploy air-to-surface missiles. It has sailed enough miles to circle the globe eight times. It has more sleeping spaces than Caesar’s Palace in Las Vegas. It was the first carrier to establish a seagoing high school. It can produce enough electricity to power a city of 150,000. It was the first ship in U.S. Navy history to have women aboard as crewmembers. PO Box 181300, Corpus Christi, TX 78480-1300 (361) 949-8068 The Longest Stretch of Undeveloped Barrier Island in the World. Padre Island National Seashore separates the Gulf of Mexico from the Laguna Madre, one of a few hyper saline lagoons in the world. The park protects 70 miles of coastline, dunes, prairies, and wind tidal flats teeming with life. It is a safe nesting ground for the Kemp’s Ridley sea turtle and a haven for 380 bird species. It also has a rich history, including the Spanish shipwrecks of 1554. For almost its entire existence, Padre Island has remained undeveloped wilderness. Because the National Seashore endeavors to preserve Padre Island in its natural state, visiting the island is very much like stepping back into the past. 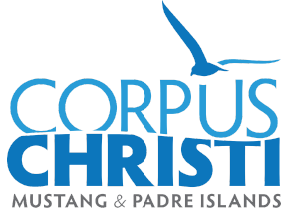 With few exceptions, visitors can now see Padre Island as it has existed throughout most of its history and how it is described in the few extant descriptions by the early explorers. One of the most interesting periods of the island's history was from World War II to 1960, when a Navy bombing range existed on the northern section of the island. Fun Fact: The Laguna Madre is one of only six lagoons in the world that is hypersaline (saltier than the ocean). 16562 South Padre Island Drive, Corpus Christi, TX 78418 361-949-4944 We are on Padre Island in Corpus Christi, Texas. Take the opportunity to create a very irreplaceable memory of riding horseback on the beach on Padre Island. Horses On the Beach is focused on offering the unique experience of riding horseback on the beach to both young & old, beginner to advanced, and anyone in between. It is their hope & desire to help you create a memorable experience. 2710 N. Shoreline Blvd, Corpus Christi, TX 78402 361-881-1200 The Texas State Aquarium is the premier aquarium showcasing the Gulf of Mexico. Discover the amazing underwater world of the Texas State Aquarium! Thousands of animals representing over 330 different species are ready to enchant, entertain, and inspire you. Corpus Christi’s most popular visitor attraction has welcomed over 10 million visitors since its grand opening in July 1990. Discover the amazing underwater world of the Texas State Aquarium! The Aquarium is an accredited member of the Association of Zoos and Aquariums and the Alliance of Marine Mammal Parks and Aquariums. The Aquarium’s mission is connecting people with nature and inspiring the conservation of the Gulf of Mexico. Padre Island National Seashore, 20420 Park Road 22, Corpus Christi, TX 78418 361-949-8068 North Padre is raw, unencumbered Texas coast—a dramatic contrast to the spring break chaos of South Padre. Near the island's north end, Malaquite Beach is rarely crowded. The visitor center has displays on local history and wildlife. Work up a sweat windsurfing, kayaking, or walking any of the 60 miles of uninterrupted sand down to Mansfield Channel. The Laguna Madre is a rarity: one of perhaps six hypersaline (i.e. saltier than the ocean) lagoons in the world. It is perhaps one of the most overlooked natural wonders in North America. If one stands on its shore and simply gazes at it, the Laguna has no obvious physical attributes to distinguish from any other body of water in the world. To be appreciated, the Laguna's unseen side, the life hidden under its surface, must be studied and revealed. Located at the south end of Ross Avenue behind the Trolley Stop, Overlooks the Corpus Christi Ship Channel. A raised boardwalk that is wheelchair accessible extends out into the cattails for a close-up encounter with Mother Nature. An observation tower halfway down the boardwalk permits a panoramic view of the pond and the surrounding flats. A free viewing scope is mounted on the tower and a free ADA-compliant scope is available at another viewing box along the boardwalk. Weekly guided birding tours are offered free of charge on Wednesdays at 9:00 am and the species of birds visible in this large open area depend on the season (migrations, you know!). The resident alligators, Boots and Bags, can occasionally be seen sunning themselves on the water's edge or gliding gracefully through the water in search of another resting spot. The walk along the Birding Center flower beds is one to remember. The beds are filled with plants that attract hummingbirds and butterflies, cacti, tropical and native plants. 1900 N Chaparral St, Corpus Christi, TX 78401 (361) 826-4667 Perched at the entrance of the Corpus Christi Harbor and right beneath the engineering marvel that is the Harbor Bridge, CCMSH is located in the heart of the SEA District. It’s a world of knowledge, intrigue and hands-on adventure that takes you through decades of epic stories and galaxies of explained and unexplained phenomenon. The Museum’s 40,000 square feet of history and science exhibits are a collection of carefully selected representations that are unique to the culture and the surroundings. The historical collections showcase 500 years of South Texas history. From historic shipwrecks of early explorers to decorative arts from area families, these exhibits give you an up close look at the life and the people of our region. 100 N Shoreline Blvd, Corpus Christi, TX 78401 (361) 884-6406 Over the past 40 years, The Art Center has evolved into a vibrant focus of creativity located in the heart of Corpus Christi’s bay front district. It is a unique organization in the Coastal Bend as it provides instruction and education for local artists, along with a venue to exhibit and sell their works. The Art Center is a destination for artists, school groups, visitors, tourists, and community members to view rotating exhibitions of original artwork and engage in art making experiences. Surf Spot and Beach TX Hwy 361 (near Access Road 3A-1), Corpus Christi, TX 78418 One of top 3 beaches to visit in Corpus Christi. 15820 S. Padre Island Drive, Corpus Christi, Texas 78418 The two main attractions of the pier are Mikel May’s Bar & Grill and Fishing. Residents of Corpus Christi head to the pier to fish from its deck. Quite often many different fish are caught and even sharks. Often you will see a hammerhead caught by a person fishing off the Pier. Mikel May’s Bar & Grill as well as the fishing is right on the edge of the pier over the water. Guests can have a fresh sea food meal each day and look out to the horizon on the Gulf of Mexico. The place is definitely filled with ambience, and at night many couples walk along the beach and pier. You don’t have to walk all 180 acres – there are vantage point for scenic view of wetlands and native habitat. Orchids have more species than any other plant. There are over 2,000 orchids at the Garden. One of the largest public collections in the South! Did you know the Rose if the National flower, and there are 100 varieties and 300 plants in the Rose Garden. Two big javalinas were recently spotted walking down the Rose Garden bridal path. The brown fronds from the palm trees (called Beards) provide bat habitat. You will love EVERY blooming thing! 9605 S Padre Island Dr, Corpus Christi, TX 78418 (361) 937-9400 A great amusement park that the whole family can enjoy which includes race cars for children of all ages, a pro track for adults, an 18 hole miniature golf course, bumper boats, a mechanical bull, an arcade with over 80 games, and special rides for children under ten. Flour Bluff Convention Center behind facility is available for special events and parties. A wildlife refuge in Corpus Christi, Texas. The Refuge is located on the western shore of Oso Bay, on Ennis Joslin Road, near the Pharaoh Valley subdivision. The Refuge is considered to be one of the best sea bird watching areas in the world. The nearby Pharaohs golf course also serves as a haven for coastal and migratory birds. Some of the birds regularly found in the Refuge are pelicans, herons, seagulls, coots, egrets, spoonbills, and ducks. The Refuge has a pier for viewing the birds and a bike and hiking trail runs through it, meandering by native plants and running along the water. There are also grills and picnic tables in the park area. Schlitterbahn Waterpark & Resort Corpus Christi promises another unique Schlitterbahn experience. Schlitterbahn Corpus Christi is a complete family entertainment destination that includes a golf club, full service restaurant and bar, and an all-new Schlitterbahn waterpark experience that boasts our longest interconnected river system yet.